If you haven’t been to Hong Kong, I can now say with twenty-four hours’ worth of confidence that I highly recommend it. Excellent food (more on that soon, I promise), summery weather well into October, and plenty to see and do, even if you’re not a high-roller. There is much more to Hong Kong than Prada stores and afternoon tea at the Peninsula Hotel, thank goodness. I’m so glad I had the opportunity to come here this weekend, and am looking forward to returning in December for a conference. But while I have a newfound appreciation for all that Hong Kong has to offer, I’ve also spent the past twenty-four hours feeling somewhat off-kilter. Actually, this feeling began even before I left Shanghai; when I arrived at the airport and got into the passport control line, I almost neglected to fill out a departure card. After all, Hong Kong has been part of the People’s Republic of China since 1997, so I wasn’t really “departing China,” right? Wrong. Travel to the Hong Kong Special Administrative Region is treated as separate from travel within the PRC, and going there counts as leaving the country. When I arrived in Hong Kong, ninety minutes later than scheduled, I was in such a rush to get to my friends’ house for dinner that I nearly headed for the taxi line without changing my renminbi to Hong Kong dollars. Luckily, I remembered in time that Hong Kong has its own money, and traded in Mao notes for bills bearing the noble visage of the HSBC lion. Once in a taxi, driving on the “wrong” side of the street, I was struck by how calm the traffic was. The driver signaled before changing lanes. He called me “madam.” He didn’t honk maniacally to alert other drivers to his presence on the road. What kind of Chinese taxi ride was this?!? And what language should I speak? Mandarin has been making slow headway in Hong Kong, where Cantonese is the most practical Chinese dialect to know. While I can read all the signage (though it’s written in traditional characters, rather than the simplified ones used on the mainland, so I read slowly), my Mandarin pronunciation of those characters won’t necessarily get me very far with a Cantonese speaker. English is useful up to a point, but as with Mandarin, there are limits—especially because I’m staying in the New Territories, which has fewer foreigners than the touristy districts down in Kowloon and Hong Kong Island. As a result, I’m seeing more of the “real” Hong Kong, but I feel like my communication skills are pretty limited. Other contrasts reflect the different political environment in Hong Kong. The SAR isn’t subject to the Internet restrictions in place on the mainland, so I can access Twitter, Facebook, and the New York Times the instant I open my laptop, without first connecting to a VPN, and the connection speed is much faster. On the grounds of the Chinese University of Hong Kong, where I’m staying, there’s a statue honoring the Goddess of Democracy that Tiananmen Square protestors built in the spring of 1989. As my friend and I strolled around a bustling market this morning, two Jehovah’s Witnesses approached us and tried to interest us in copies of The Watchtower, which doesn’t happen in Shanghai. All of these things, small as they are, contribute to my persistent feeling that things are just slightly off; that I’m in a familiar environment, but don’t quite recognize it. In part, this unbalanced feeling reflects Hong Kong’s resistance to integration with the mainland, the topic of a recent ChinaFile article by scholar Sebastian Veg. This is a place that, in the face of official policies and pressure from the central government, has maintained a unique identity and fiercely defended the rights (to freedom of expression, freedom of religion, and so forth) that it enjoyed as a British colony. Hong Kong will not be easily assimilated into the PRC, and this realization is vexing the leadership in Beijing. 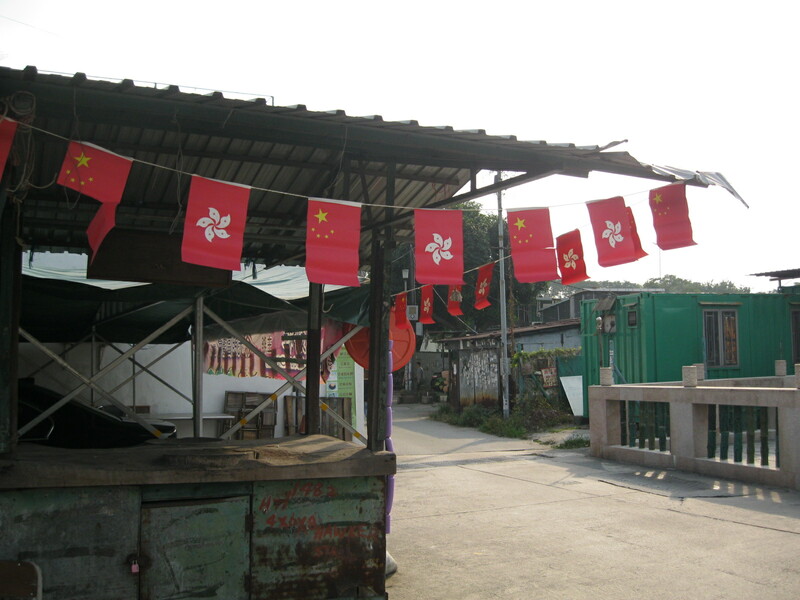 One country, two systems, two flags: a banner in Ping Shan displaying the flag of the Hong Kong SAR (red with white flower), alternating with the PRC national flag. But from another perspective, my recurring confusion stems from the fact that Hong Kong and parts of the mainland are now more alike than they are different. Hong Kong looks like Shanghai—or vice versa—and so I expect the money, traffic, language, and Internet frustrations to be the same as those I encounter at home. And when they aren’t, it throws me for a loop. That’s not the case anymore; Shanghai now has a selection of consumer products and restaurants to rival Hong Kong’s, and the Pudong waterfront can go skyscraper-for-skyscraper in a head-to-head match with Central. Hong Kong is still a place to seek respite from the stresses of mainland life, but it no longer flattens the visitor with culture shock. What I’m feeling is more like a mild episode of culture vertigo—and I hear the best treatment for that is a healthy dose of dim sum and a tall glass of milk tea. I’m just not sure how to order it. Interesting that Hong Kong and the mainland are getting more similar. I first saw Hong Kong in 2002 and I said “Wow, how Chinese!”. Then after living in a small city in Guangdong for 6 months, I went back to Hong Kong and said “Wow, how Western!”. At that point in time it seemed truly in the middle of the two cultures (at least to me). Anyway, I ended up with 20 odd trips (and visa runs) to Hong Kong up to 2007 and I love it there.